The trouble with adding models to this army is that it is painted so fast and loose that you can't really add elements with lots of detail... like a banner, without them looking really out of place. The solution: Paint it fast and loose right? I've had the model for some time now. I think he had a regular storm bolter. And I've had the plastic banner for a while too. Put the two of them together and presto, instant banner bearer. Like I said, I've been meaning to add one to my list for a while, but I'm either too busy or too lazy to do it. Having the model already painted was what pushed me over the edge. All I needed to do was swap out the arms and glue the banner in place. I never paint banners like this so this was a real experiment to see if it would work. I found the old Dark Angels codex and copied the image from there. I just took a black drafting pen and freehanded the design right onto the plastic banner and got it as close as I could. Then I painted the whole thing like I did my regular Deathwing troops... either light grey or dark grey. I did cheat a bit and added some blends in there so that I could keep the detail without having to add more colors to my two base color scheme. Then I added some washes and highlights using the same colors I did in the rest of the army. I did add a new color, yellow, to the mix since it was a big part of the banner. Had I been a bit more of a purist, I would have kept my palette limited and worked through the issue. Not this time though. This adds a nice big green piece to my army and helps break up all the tan. Now that I've got a green and blue (the Librarian) piece to the army, I need a black piece. That's going to come by the way of a Chaplain at some point. I've got all the bits, I just need to get around to actually building him. All in all, the whole thing took just over 45 minutes from start to finish which is a far cry from the 3 hours I spent on the Storm Wardens banner alone. I really hate how easy you make it sound and look. LOL. Especially on a model that turned out looking so good. I like it, I really do. Banners are one of the few things that I just dont have success with. 45 minutes! I think you use magic. Only thing that makes sense. 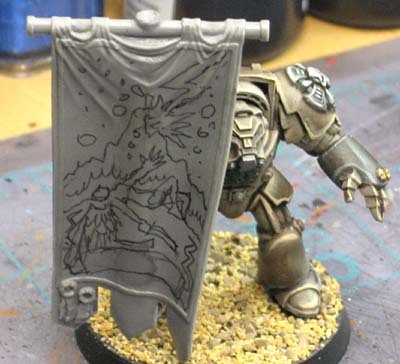 It takes me hours to paint one person, let alone a FREEHANDED banner. Gurilla: It is easy once you break the image down into larger/simpler shapes. RuntMcRory: This is the only guy to survive the last game I played against Blood Angles. Of course it probably helped that he was in a Land Raider. Playing in the Snow: It only took 45 minutes becasue of the detail left out of the banner. It's almost a sketch of a banner without all the fine work in it. If I were to add all the fine details, it wouldn't match the rest of the force and the finish time would go way up fast. Well whether you cheated or used magic (heretic!) or whatever, it looks fabulous! Well done. I can barely even freehand an adequate Eldar rune, much less a whole banner. This makes me even more envious of your banners! This looks really great. After 45 minutes I'd still be looking at it wondering where to start. I've said it before and I'll say it again - you're my speed painting hero. When I do low end commission work I can knock through a paint scheme fairly quickly but nothing like what you do. I stand in awe. It looks great Ron. I think it adds a really nice contrast of color to the rest of your unit/army. Stands out in a good way. It looks really nice and seems to tie well with the colours of the mini. And I'm so jealous because I can't freehand to save my life! Great paint job. Quick question. Did you replace the weapon on this model with the banner or consider that it still has a Power fist? 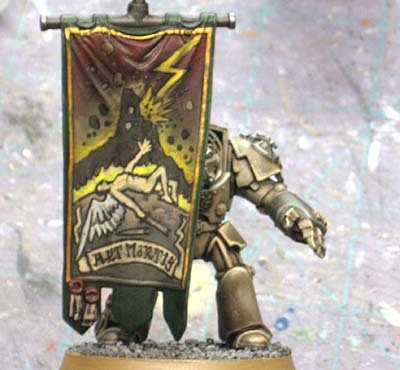 I can't work out if adding the company deathwing banner to the terminator squad should remove the weapon (by holding the banner) or if it is legal to just wear the banner on the back? Any thoughts? Thanks. Robin: I suspect you could do it either way. Leave the weapon in his hand and put the banner on his back or just replace the weapon like I did. I kept him "standard" with the powerfist and stormbolter so it made things easy to remember. 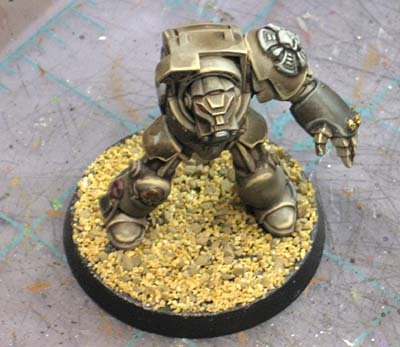 I suppose you could attach the storm bolter to his waist to be WYSIWYG for those opponents that require it.